Sophisticated and precious, this ring setting, suitable for colored stones of remarkable size, ideally oval or cushion cut, will create undoubtedly a jewel of great visual impact. The elegant profile created by the play of diamonds size valorizes the center gem. 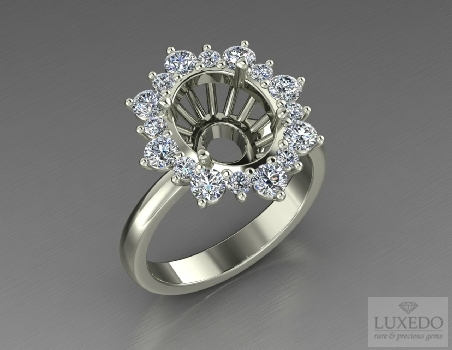 For those who are looking for a truly unique ring and beyond fashion, this is the perfect choice. Color G, clarity VS, brilliant round cut, medium clarity very good.